Shipping will be closed from 4/18/18 until 5/10/18. All orders received will be shipped after May 10th, Thank you for your patronage and understanding. 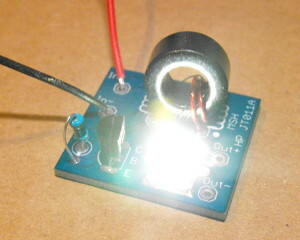 This is a high power Joule Thief Kit that includes a Cree 1Watt XLamp white LED. This new kit has a very high permeability core that allows you to make the transformer with just one winding of each wire, this greatly speeds build time of this kit. This kit comes with the surface mount LED soldered to the PCB. Warning these are class 2 LEDs per IEC 60825-1. These LEDs can damage your eyes!.